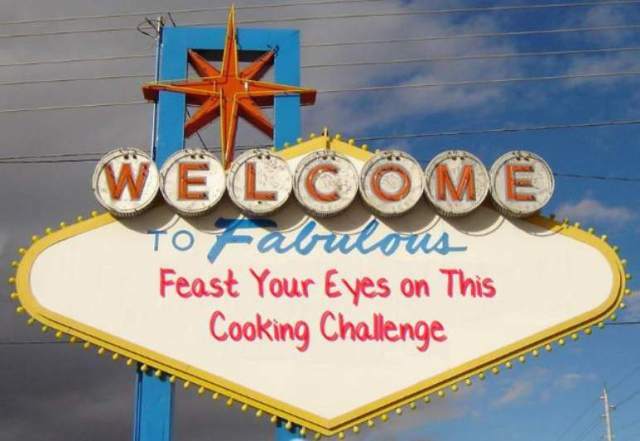 Feast Your Eyes on This Cooking Challenge: Round 1 – I Love It Spicy! Artichoke hearts and hearts of palm….Buddah, are you pregnant? A peanut butter and jelly sammich and a garden salad is a meal. I’m eating that right now. Anyone have fresh artichokes?? I have a real good recipe for em, but I guess it’ll have to be canned 😥 . This challenge involves soulful romance….definitely Cocoa Butter!!! I knew what I was making before he got to the 2 of 7! The choices only made it easier…..
Super stoked about this competition.. Cant wait to see what everyone comes up with, cant even wait to see what I come up with… This should be fun.. Good luck to everyone!!! I have them here in Cali. Tuesday, the sun is shining, snow is melting….something resting, something’s reducing, something simmering….all to the soothing sounds of Lou Rawls!! Love is in the air my friends!!! WATCH OUT!..it just might sneak up and bite ya! You’ll never find, as long as you live…. Back in the day that was my Number 1 Karaoke Closer, always ends a great set! Well it was a long day of prepping, meticulous trimming, soothing audio…I call it Tantric Food Embrace…it’s like Karma Sutra in the kitchen in here, the smell of romance in the air! After this day of culinary courtship, i long for tomorrow….that’s when this suitor is going to bang out some deliciously seductive eats!! Wow Johnny! Them sure are some pretty words you got there!! Good luck to all who enter! Too bad I will not be able to participate for certain and completely fair reasons. So I will leave the cooking to you all and focus on Sponsoring a couple of rounds. :racecar: City in da House. Back from Vegas/LA. Fun trip, but now its back to business. When you contestants film your video, film the whole thing for your website. Then just edit it down to 5 minutes for the contest. I will post the full length video of the winner after the round is over. Of course, the winner will need to send it to me. SHOW ME DA :heart: !!! I’ve been using to many soothing tunes :hungry: in the recipes, it’s getting my head! I have em hear in cincy! You should be able to find them at your local grocer. A very interesting ingredient list to say the least.Was at jungle jims last night picking out some OH! so beautiful artichokes. I found a very complex rose and some very nice hearts of palm. It all comes down to the quality of ingredients. You cannot turn a frog into a prince even with all the love and cocoa butter in the world. lol This is going to be fun! Good luck everybody. All this love stuff is making me queasy. Now excuse me while I go punch a clown. Then that is not a PRINCE johnny, that is some sweet, sweet, delicious chocolate THUNDER!lol Which is a powerful force! Hmmm … Cayenne Clown Punch. No, wait, not hot enough. Bhut Clown Punch (Bhut … punch … joke? :_redpepper:). I think there’s a new product there, somewhere. We’ve even got ’em here in Minne-SNOW-ta, don’cha know. Personally, I prefer donkey punching.